The climb finished 4 weeks ago, and I’ve had time to reflect on it. “Madness” is a word which went through my mind a lot on those 7 days on the hill. “Sit down” was in my head a lot on the summit climb, as was the James song. I didn’t want to write a “what I did in my holidays” kind of essay, so this is just about impressions, memories, feelings. Here’s the A to Z. Amazement. At some of the views and sights we came across on our journey. At my physical resilience – we walked 5 hours uphill to base camp the day the summit climb began, and then 10 hours uphill overnight to get to the top. We had a 3 hour downhill jaunt to get back to base camp for lunch and a short nap. Then a 9km afternoon walk in 3.5 hours to get to our camp for that night. Up at 5ish the next morning to set off at 6.30am for the park gate. 20km in 6 hours. I still shake my head when I think about it. Cold. I’m used to cold. Rural New York in mid-winter. Lithuanian Decembers with 20 below at night and a balmy -10°c at midday. But this was something else. Camping in the cold. After dark we all wore all our layers to eat dinner in the mess tent. After dinner we got into our sleeping bags to stay warm. It was icy on the summit, with a biting wind. Technically, it is Arctic at the top. Dawn, camp 2. Ice on the ground. Death. I’m not trying to be melodramatic, but it happens up there. Heart failure. A slip and fall. Hypothermia even. AMS (acute mountain sickness), which can turn fatal very quickly through pulmonary or cerebral edema. Bleeding in the brain or the lungs, in other words. Luckily we didn’t have to witness any casualties but I did still think about it. Dehydration. I did get dehydrated towards the end of the summit climb. Drinking took my breath away. I couldn’t spare it. I also had nausea at that point, so the thought of the horrible tasting water turned my stomach. I drank a lot on the way down from the summit. Despair. We reached Gillman’s Point after 8-9 hours of climbing on that dreadful night. It’s where you get up onto the crater rim. It was daylight by then. When I saw how far it was from there to the summit, my inspiration, determination and motivation just collapsed. I was in poor shape physically – see “fear”. I didn’t think I could walk another 1.5 km, even although the elevation would be modest – just 600 ft. I wanted to sit down, get my breath and get off that hellish mountain. My guide pushed me. He pulled me. He bullied me to the top. Dirt. I didn’t have a shower or shave in 6 days. I didn’t even look in a mirror in that time. 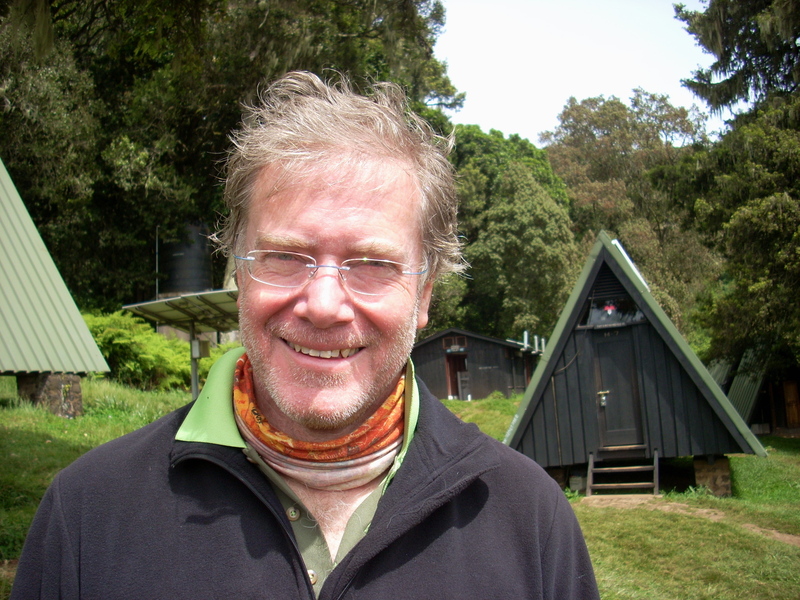 When I did – mid-morning break on the last day, when in the toilets at a campsite – it was a shock. By the 2nd day everything I touched seemed to be dirty. Rucksack, boots, gaiters, clothes. By the end I was stinking. Remember, we walked 50+ miles and ascended 12,000 feet in that time. Day 7. Dirty, smelly but almost done. Discomfort. For 6 nights I was in a basic camping tent, sleeping in sleeping bag on a foam mattress. My neck started to hurt after 3 nights. It got so bad I couldn’t carry my daypack. The Diamox (a drug which can help prevent AMS) also caused discomfort, as in “I must get out of this tent immediately to p**”. First night I took it, I went 4 times in 5 hours when I should have been sleeping. And I was p**ing like a racehorse. Mind you, the stars were totally spectacular that night. Disorientation. Perhaps better described as spaced out. At 19,000 ft I was spaced out. My brain just would not work. 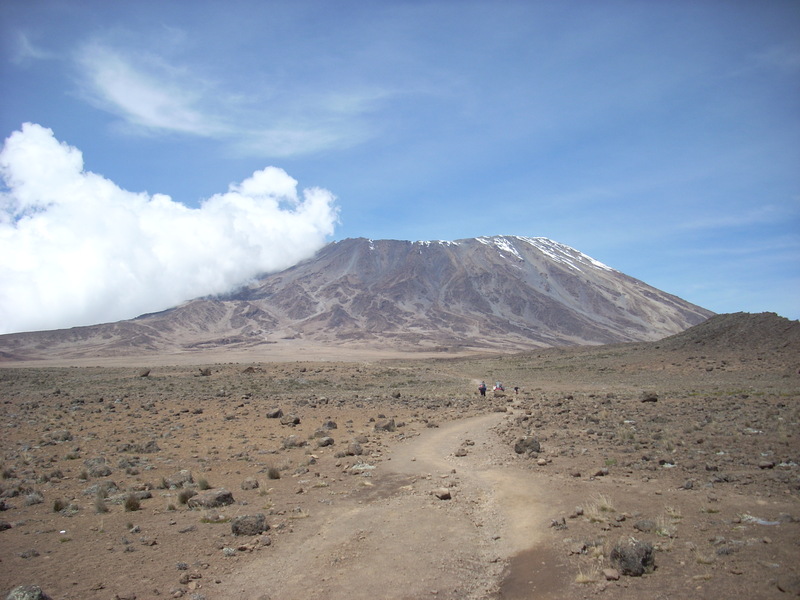 My memory of the 2 hour walk from the crater rim to the summit and back is very patchy. It was like an “out of body” experience. Surreal. Not in a pleasant way, but as in “if you’re going through hell, don’t stop”. Dust. The volcanic dust is everywhere close to the summit. Even climbing in the dark on the final ascent to the summit, I could see it swirling in the light of my headtorch. Coming down from the summit we plowed through it – literally – as we kind of skied down the scree. Elation. It kicked in as I got onto the crater rim at Gillman’s Point. 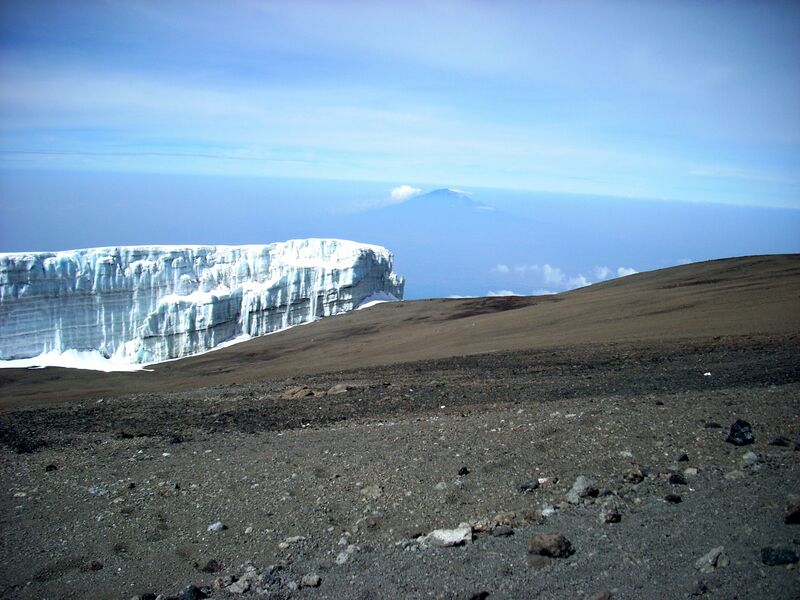 That was before I saw how far away Uhuru Peak was (see “despair”). I also had elation when I got to the summit, but tempered by the fact that I was feeling so bad by then I couldn’t enjoy the moment. 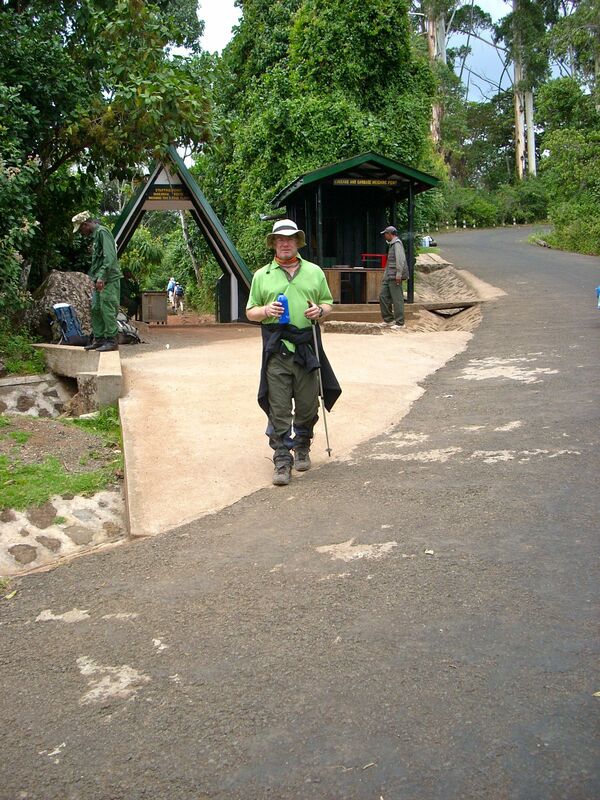 Elation overtook me when I got to journey’s end at Marangu Gate – and an ice cold Coke to celebrate with. Fatigue. Maybe I mean exhaustion. We climbed for 5 days to get to base camp at 15,000 ft. Then we left base camp at 11.30pm on the 5th day (after 1 hour’s sleep in my case) to climb all through the night to get to the summit 10 hours later. It’s not just being tired from the exertion. I was. But by 8am I wanted to sleep as well. Fear. I was scared twice. 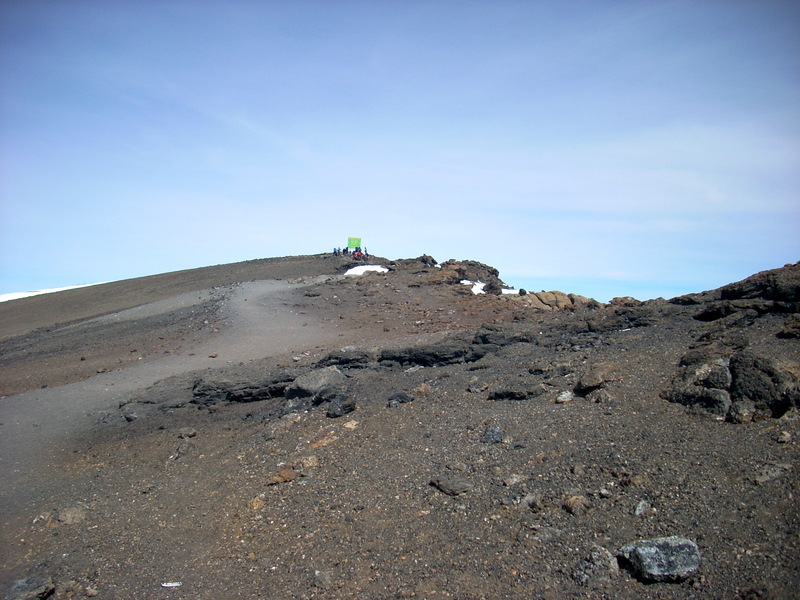 Both times on the crater rim as I walked the ridge from Gillman’s Point to the summit at Uhuru Peak. My heart was going so fast I was scared it would just give up and stop. I couldn’t get my breath even standing still and doing nothing. I was exhausted. I didn’t know how I could go on, or get down. I thought I was going to die up there. Disorientation and hallucinations come with the lack of oxygen. Or maybe it was for real. The second time was crossing the frozen snowfield on that ridge. Just ice and frozen hard packed snow to walk on, with a sheer drop down into the crater to punish a slip. Gratitude. In general, for getting up & down alive. Specifically grateful to Jonas (chief guide), Jackson & Prosper (guides) for getting me to the top. Also to the cooks & porters for playing their part to the full. Heat. One irony of the whole climb is that it starts and finishes in tropical rainforest. 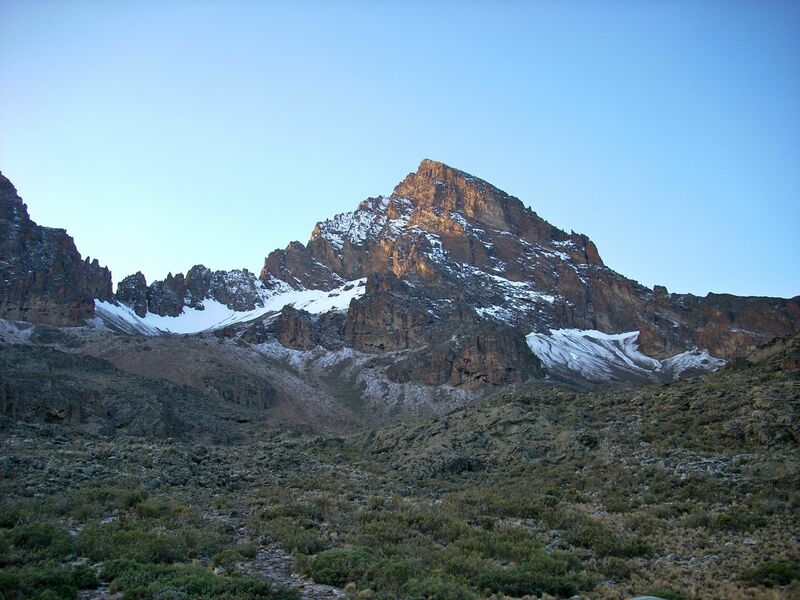 On the final day – heading down from camp at 13,000 ft – we were walking in frozen puddles at 6.30am but in shirtsleeves by lunchtime. The heat did not bother me after that Arctic cold at the top. Hunger. We were well fed. The cooks did a wonderful job. But the altitude takes your appetite away and gives you nausea. Some people vomit as they climb, but I was never that bad. By the time we got to the summit climb however, I was a nausea victim. Hungry but unable to eat. Not ideal when you need all your energy for a 10 hour climb rising 4,000 ft.
Inspiration. 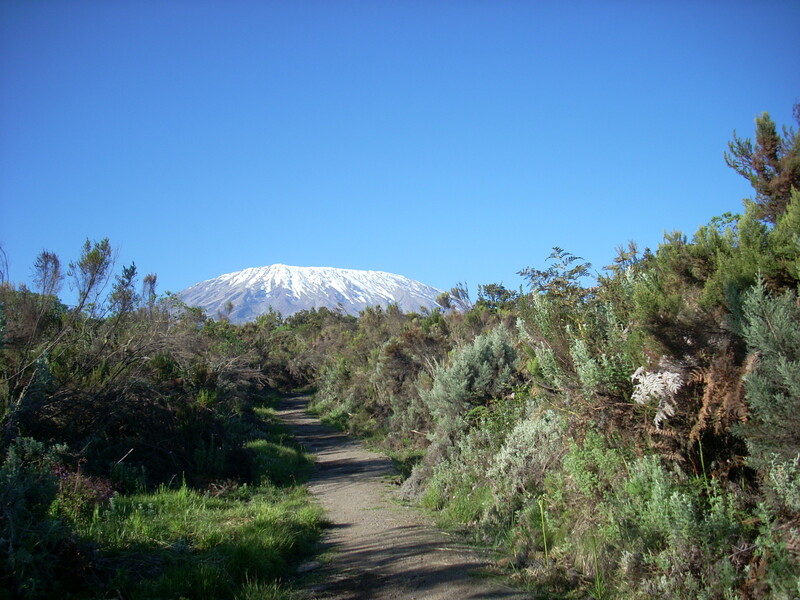 As we started the summit climb, the guides sang Swahili songs. That lifted me. It encouraged me. 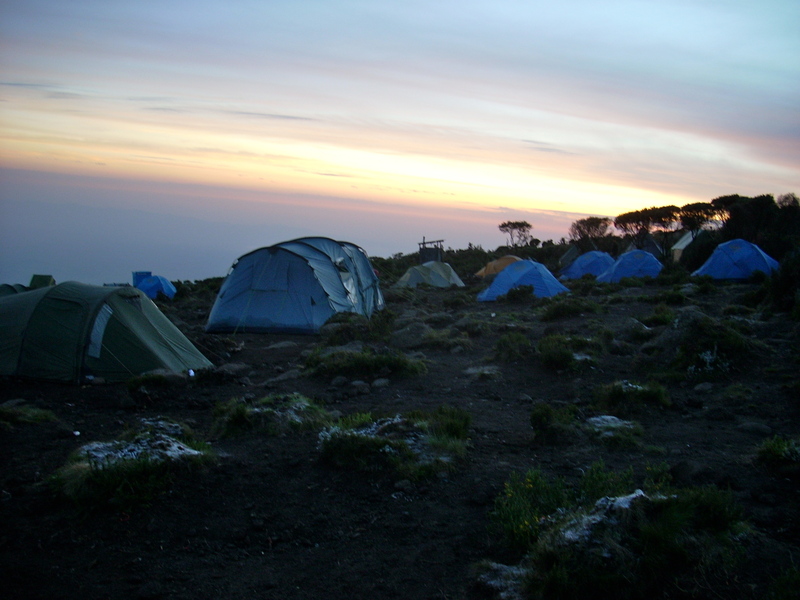 I was inspired by sunrise over Mawenzi about 6 hours into the summit climb. Climbing in the dark was soul destroying. Dawn meant daylight. Dawn meant we were getting close to the summit. Thoughts of a couple people inspired me as well, on that long night. A friend who’d died the month before. Another who hasn’t long left. They’ll never get to do something like this. I had to keep climbing and get there. Nausea. At its worst from about 17,000 ft upwards. The altitude causes it. I was hungry and thirsty but the thought of taking anything made me want to throw up. It also happened back down at 15,000 ft after we’d descended. We came down very quickly. 4,000 ft in 3 hours, and that can cause altitude sickness too. I ate some pineapple for lunch, but that was it. Pride. Proud to have achieved something very tough mentally and physically. Water. We were tasked to drink 3 litres of water every day. Dehydration is one of the factors which will make you more susceptible to AMS. We had to carry those 3 litres, and the idea was to drink at least 2 litres before lunch. Otherwise, the call of nature might come in the middle of the night. Going to the toilet (or the bushes) at night is a disaster if you’re in a nice warm sleeping bag and it’s well below zero outside. The water was neither fresh nor cool – except on the summit climb when it froze in the bottles. It had water purification tablets in it, and tasted pretty grim (but better than getting AMS). That’s why the ice cold Coke caused elation (see “elation” above). Wind. At the summit the wind cut right through. With my down jacket & mittens, 2 fleeces, 2 t-shirts and thermal underwear, my torso was fine. My face suffered. I’d removed the balaclava to help breath better. This entry was posted in sports, Tanzania. Bookmark the permalink.